Show your stand mixer some love today by heading over to QUILTsocial.com where there is my tutorial about making a stand mixer cover. You might want to make this for your own "workhorse" of the kitchen or for the bakers/cooks on your Christmas list. Fabric, batting plus this tutorial and presto, you have it made just in time for gift giving. I love my stand mixer! I hope you have enjoyed and are inspired by my How to Make Your Holidays Sew Easy tutorials at QUILTsocial.com this week, I know I had fun making the items and writing about them. 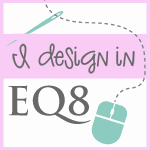 ​Be sure to share on QUILTsocial.com when you try my projects. We would love to hear your comments as well. Quilt isn't familiar to everyone yet that's why we need to exert an effort to have it introduced to a great number of people. Actually, they might get addicted with the prices of doing it because they can practice their creativity and their planning strategies because the artistic part of the project is totally associated with them. By the way, I am hoping to make a perfect art for me. I've tried doing it for myself but I cannot achieve th design I planned at first!